The closer the Report got to the end, the louder I chanted at the beginning of each episode: “Stephen! Stephen! Stephen! Stephen! Stephen! Stephen! Stephen!” If I would never get to see Colbert live, I might as well pretend. I got on the train late. I didn’t start watching Colbert until 2010, but once I started, there was no stopping me. 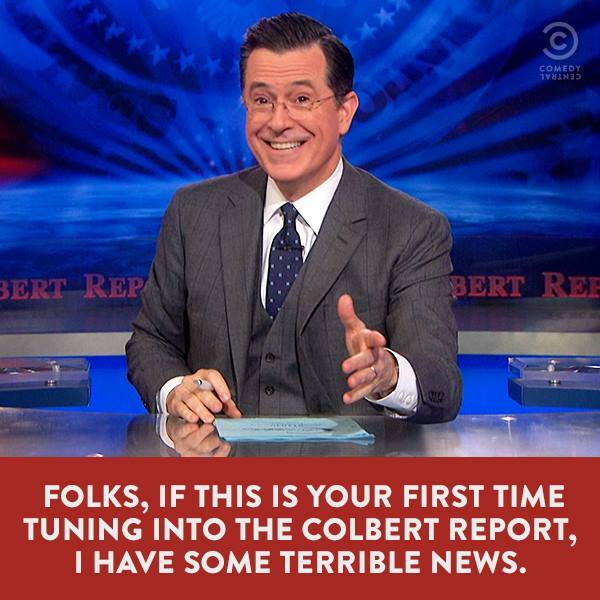 As someone who loves satire and the absurd, The Colbert Report felt like something I’d waited for forever. It was nonsensical and poignant, zany and intelligent, and it pulled off that trick of satisfying the viewers while making them want more. If you didn’t watch the final Colbert Report, put it on your to do ASAP list. When the episode ended, I felt sort of empty. I don’t watch much TV, and this was one of the shows I felt engaged me, really made me think, really stimulated me creatively. And I always loved it when Stephen would have a political guest on, and he’d ask the really tough questions that everyone wanted to know. One of my regrets in life is not having a meteoric rise to fame so I could be a guest on the show. Well, Stephen, you certainly changed mine.